The deadline for nomination entries is Thursday, 18th January 2018. The organisers reserve the right to reject the entries submitted after the deadline. 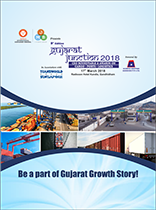 The official online forms are available at www.gujaratjunction.com or www.fairplayexpo.net for filing nomination entries. All entries will be acknowledged immediately on submission. If the acknowledgement is not received within 24 Hrs. The entries which are short-listed, Finalists, will be informed before the Award Ceremony. Please ensure that the short-listed companies depute their representatives for the award ceremony.